Secretary Thapaliya recommended for chief election commissioner - Integration Through Media ....! KATHMANDU: The Constitutional Council has recommended Secretary of the Ministry of Federal Affairs and General Administration Dinesh Kumar Thapaliya for the post of chief election commissioner. The Council’s meeting on Monday also proposed activist Bishnu Maya Ojhayo to be a member of the National Inclusive Commission. The post of chief election commissioner has been lying vacant since former chief of the Election Commission Ayodhee Prasad Yadav retired on Sunday. Its member Ilama Sharma also retired on the same day. The Election Commission has a team of five members including the chief. 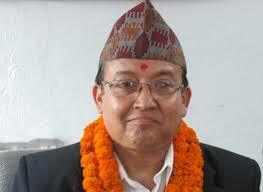 Narendra Dahal, Ishwori Prasad Paudyal and Sudhir Shah are the sitting members of the commission.